As you are looking at the truck driving jobs that are available with local Arizona trucking companies, you need to understand the different types of trucking jobs in order to know what your expectations will be for your new job. Understanding these differences can be a great way to make sure that you are working a job that you will enjoy. There are a few differences between regional and OTR trucking. Most AZ trucking companies offer OTR trucking jobs, which are often called “long-haul” trucking. Sometimes, these routes might be near the local area, although most of the time the routes will be spread over a large area. In fact, it is common for OTR routes to include as many as seven or more states within a single route. The advantage to this type of route is that you will be able to see many different parts of the country. But, you will need to be prepared to be on the road for as much as a week or two at a time. If you don’t want to be on the road for long stretches of time, then you might consider the regional truck driving jobs that are available with our company. With regional trucking, your routes stay close to the Arizona area, allowing you to return home more frequently. Often, these routes are contained within an area that is compromised of three to six states in the local area. If you have a Class A Commercial Drivers License and you are looking for a truck driving job, we would love to talk with you! 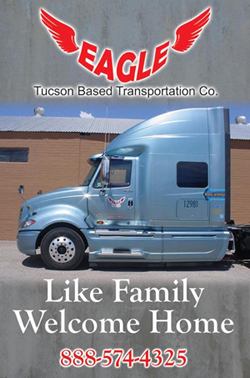 Contact us at Eagle Transportation, and we can explain the types of trucking jobs that are currently available. We are also open to talking with new drivers who have recently finished their CDL training and are looking for experience, or anyone who is thinking about going to driving school but hasn’t started yet.